The Central American country of Costa Rica may be small but it is beautiful. Its natural resources are abundant and they contribute in many ways to the economy. For example, a lot of people from around the world come here to experience Costa Rica fishing which is known to be one of the best. On its western side is the Pacific Ocean and on its eastern side is the Caribbean Sea. There are also a number of lakes and rivers within the land mass. Some spots have been identified as excellent sources of certain fish and they get lots of visitors every year. This top sports fishing destination is a haven for anglers. Most of the enthusiasts that come here are attracted to the presence of blue marlin. These are massive creatures that can exceed 400 pounds. The average adult is 11 feet long so just catching one can be seen as a great reward. Some come here for the sailfish which is slightly shorter but is just a beautiful. It can be thrilling to watch them in action as they race across bodies of water with their impressive speed and acrobatic leaps. 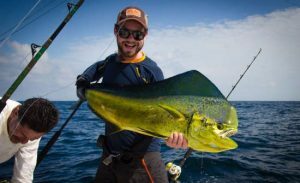 Aside from these two, people are also keen on fishing for Wahoo, Yellowfin Tuna, and Dorado wherever they can find them. There is quite a number of prominent fishing spots along Costa Rica’s Pacific stretch. Those who are interested in coming must take note of the kinds of fish that are abundant in each spot, as well as the peak seasons to increase the chances of a great catch. There are certain activities like deep-sea fishing that can bring in nice rewards all year. The best way to go about this is to talk to local experts who can customize a tour based on client needs. Among the places that you can visit are the Los Suenos Marina, Crocodile Bay, Tamarindo, Marina Papagayo, Quepos, and Marina Pez Vela. Lake Arenal is a good option if you are looking to do some inland fishing. This is the largest lake in Costa Rica, located below a volcano. There are lots of freshwater fish like rainbow bass, guapote, machaca fish, and so on. You might also venture to the north and check out the Caribbean coast. There are wetlands that have plenty of Snook, Tarpon, Tuna, Dorado, and Gaspar. Just make sure you bring the right equipment to handle them. You will also need to acquire a fishing license to commence your activities. Some charters will include the fee in their package.